Bare Hill Holiday Village v Kyrenia, Kypr: Zarezervujte nyní! 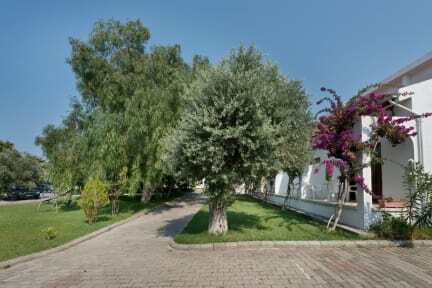 Bare Hill Holiday Village, Alsancak - Kyrenia, North Cyprus is a friendly, relaxing, quiet holiday complex surrounded by beautiful landscaped gardens filled with almond, olive tree, banana and passion fruit trees. It is located near a beautiful little village called Alsancak which is based on the slopes of the Kyrenia Mountains and is only 6 km west of the glorious historical town of Kyrenia. From Bare Hill Holiday Village with in a 2 minute walk you will find yourself in Alsancak where you have the access to many restaurants and markets. Our holiday village is also only a 2 minute walk to a tranquil sandy Golden Bay, Denizkizi and Escape Beach.Also Beach facilities include all watersports and scuba diving. 1 minute walk to the main road where you have the access to all the buses travelling all over Northern Cyprus. Bare Hill is situated 10 meters from the main road. Each villa has split air-conditioning, galleried bedrooms, a well equipped kitchen with breakfast bar, kitchen, kettle, shower and WC on ground floor and lounge with TV and telephone. The villas also have their own private, large and fully furnished terraces all facing the pool with panoramic mountain or sea views and the shade of the beautiful Mediterranean flowers or grape vines. 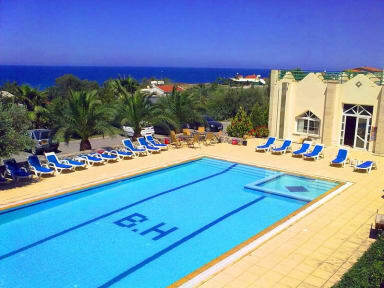 The hotel rooms have absolutely fascinating views of the Kyrenia Mountains and the deep blue Mediterranean Sea. Each room has air-conditioning, TV, direct telephone, kettle, fridge, balcony and en-suite. With its spacious clear blue swimming pool with children's safety area. Within a 2 minute walk from the Bare Hill, you will find your self in a little village called Alsancak, where you will have access to many restaurants and markets. We greet you with the slogan come and see Mediterranean from ''Bare'' perspective.